The evolution of competitiveness Competitiveness is a measure of a country's advantage or disadvantage in selling its products in international markets. moreat the national level is mainly shaped by two factors: first, the rate of increase in wages (and other costs) relative to the rate of productivity growth and, second, the nominal exchange rateNominal exchanges rate is the price of one currency in terms of another.
. While wage increases per se raise production costs and reduce competitiveness, productivity growth has the opposite effect. If both wages and productivity grow at the same rate, unit-labour costs stay steady; and so would external competitiveness assuming that profit margins, indirect taxes and other related factors remain unchanged too. Exchange rate changes broadly affect the competitiveness of all producers of tradable goods and services in a country relative to producers in trading partners by changing the foreign currency price of home exports and domestic currency price of foreign imports. Since the breakdown of the multilateral Bretton Woods system of pegged but adjustable exchange rates in the early 1970s, currencies have entered a new era of non-orderly floating exchange rates, leaving it at countries’ discretion to choose their particular exchange rate regime. Members of today’s European Union established a new regional system of pegged but adjustable exchange rates, and at the end of the 1990s, some of them permanently fixed their exchange rates and adopted the euro as their common currency. Among developing countries, too, many have chosen to peg their currencies to or stabilize them against some anchor currencies, most prominently the United States dollar, at least during some of the time (Table) . 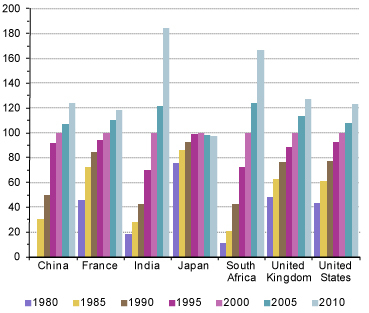 (Index numbers, 2000=100) Source: UNCTAD secretariat calculations, based on OECD, OECD.Stat Extracts and Economist Intelligence Unit (EIU) online database . Correcting movements in nominal exchange rates for inflation differentials yields real exchange rates, which are more accurate indicators of changes in competitiveness. A still superior indicator of the overall competitiveness of a country relies on measures of real effective exchange rates Real effective exchange rates (REERs) take account of price level differences between trading partners. more(REER). The term "effective" means that exchange rate changes are not measured against one particular currency, but instead use an average index of a whole basket of currencies, each weighted according to the issuing countries' respective importance as a trade partner. (Index numbers, 2005=100, CPI based) Source: UNCTAD secretariat calculations, based on BIS, Effective Exchange Rate Indices database . 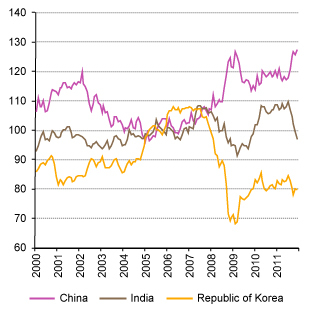 (Index numbers, 2005=100, CPI based) Source: UNCTAD secretariat calculations, based on BIS, Effective Exchange Rate Indices database , for example, underwent a significant appreciation in their REER following the recovery from the crisis; until renewed stresses arose in mid 2011. Renewed instabilities are mainly related to the European crisis. The euro area provides a special case in which competitiveness positions among members can no longer change owing to exchange rate changes; trends in relative unit-labour costs determine competitiveness positions inside a currency union. To avoid dislocations in intraregional competitiveness positions, national wage trends need to follow an implicit norm that is the sum of national productivity growth and the agreed union-wide inflation rate (defined by the European Central Bank as “below but close to 2 per cent”). Countries in the periphery that are experiencing severe public-debt crises today departed from this norm somewhat in the upward direction, whereas Germany, the economy with the largest trade surplus within the euro area, missed the implicit norm most widely, but in a downward direction. 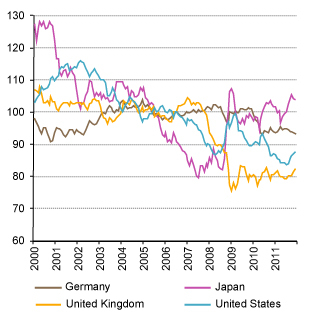 As a result, over time Germany experienced cumulative competitiveness gains over its European partners. Widening current account imbalances inside the euro area by necessity also had their financial counterparts. 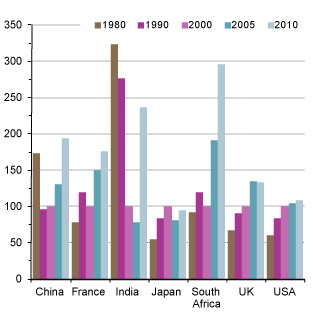 In some cases, lending flows towards current account deficit countries caused property bubbles. The bursting of those bubbles in the context of the global crisis resulted in private debt overhands that first triggered banking crises and eventually turned into sovereign debt crises. The build-up of unsustainable current account positions fosters financial fragilities that tend to end in tears, whether at the global or regional level, whether in the developing or developed world. In conclusion, misaligned exchange rates affect competitiveness positions and cause current account imbalances, which matter both at the regional and global levels. 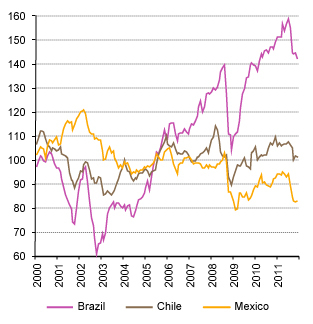 Inside currency unions, relative trends in unit-labour costs are the key. In general, exchange rate movements that are persistently inconsistent with achieving balanced global competitiveness positions provide strong evidence for the need to coordinate global currency markets. Exchange rate movements that are persistently inconsistent with achieving balanced global competitiveness positions provide strong evidence for the need to coordinate global currency markets.